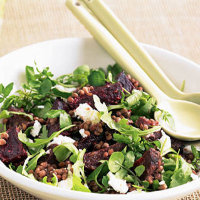 This quick salad of warm beetroot, creamy goat’s cheese and fine textured lentils makes a substantial vegetarian lunch. Wearing disposable vinyl gloves when preparing beetroot will prevent your hands from staining red. Organic vintage cider is a good match for this hearty salad. It’s full-bodied, rich and has a satisfying flavour.